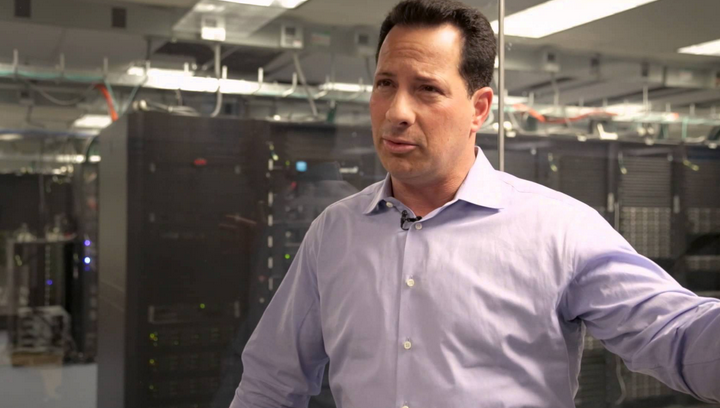 SimpliVity chairman and chief executive, Doron Kempel. Storage killer, SimpliVity, is closing in on market leader, Nutanix, in the booming hyper-converged infrastructure business. The company, which crams everything below the hypervisor into its Omnnicube, with the support of x86 servers, has hit a $US1 billion valuation nine months faster than its bigger rival and is growing at three to four times year over year, in terms of sales. It has also grown its staff from 100 to 460 in just two years. Nutanix and SimpliVity were both founded in September 2009. However by April 2011, Nutanix had shipped their first product. Simplivity spent two more years developing an accelerator card, a new file system and a global unification system. It shipped it first box in April, 2013 and since then has sold 2,000 systems to its target market of mid-market enterprises with less than $US2 billion turnover. The secret of its success is that it deduplicates, compresses and optimises the data at inception or at the earliest point in the stack. This means there is no need for storage deduplication, WAN optimisation or backup deduplication. It also means the backing up, cloning or recovering of VMs is much faster. SimpliVity also now supports the KVM hypervisor and OpenStack, along with VMware’s ESXi, which could open the way for a smaller cheaper box for smaller businesses. But while SimpliVity attempts to rein in the runaway Nutanix, challengers are also making headway in what is becoming a crowded market. They include Pivot3, VCE, Maxta, VMware, Scale Computing and EMC. However, SimpliVity chairman and chief executive, Doron Kempel, told ARN he was confident his company’s technology, which he describes as “convergence 3.0”, would stand up to rivals and anticipated readiness for an initial public offering in the first half of 2016. “The evolution of convergence starts with the legacy stack,” he said. “The world spends $US107 billion on that stack every year and of that 57 per cent is in the midmarket. “So that midmarket, with companies below $US2 billion is 57 per cent, is about $US60 billion. That’s a huge market and in that market we’re going very fast." Kempel said VCE, Flexpod and Pureflex did “wonderful things”. “They took the server and the switch and sold about $8 billion of that, however you still need to buy protection, efficiency, performance and global unified management separately,” he said. “Convergence 2.0 inlcudes Nutanix and Evorail, they put the storage inside the server without the accelerator card. "This is great for VDI, but you still need to buy efficiency and global uinfied management. We put all of this into the cubes and we call this convergence 3.0. “If this is true, this is an architecture which delivers the best of both worlds. While Cisco is currently a partner with its UCS servers, Kempel said the plan was to be server agnostic in the near future. “Cisco is a great partner because they don’t have storage portfolio, so they don’t fear us. The two players that we thought were optimal for us were Lenovo and Cisco,” he said. It has denied hatching a plan to acquire Nutanix, and Kempel has indicated he has loftier aspirations for Simplivity than to be eaten by a larger storage company. “SimpliVity believes we have a huge opportunity, and given the availability of capital and the rapid growth - we are growing about 3-4 times sales year over year - so we’re going very fast,” he said. “If all of our assumptions are correct, why would we sell the company? Kempel said the secret to the technology was the deduplication, compression and optimisation of the data at inception. “Simplivity is a data virtualisation company and that sounds mysterious,” he said. “But an abstract way of thinking about it is we think about Simplivity to data in the same manner as we think about VMware to server virtualisation. “What we have done is we have virtualised the data and we have solved the data problem. The Omnicube and x86 servers replaces everything below the hypervisor, according to Kempel. “One of the things that we looked to do with Simplivity was to dedupe, optimise and compress the data at inception so that nobody can do it earlier,” he said. “The questions we asked ourselves in 2009 is why so many products? Our view is the architecture of the data, the day the data is being managed, is not meant to address a world with VMware, Amazon a deluge of datacentres. There is just too much data, too many IOPS. “All you need to do is vMotion and storage motion (with partner VMware), and your data moves into the smaller boxes. “This has been our vision since December 2009, when we decided to give a green light to this particular project. SimpliVity vice president, APJ, Scott Morris, said the company was 100 per cent channel aligned with Distribution Central as its distributor in Australia and New Zealand. “We have no direct sales force anywhere around the globe and that’s quite unique from a vendor perspective,” he said. “More than 50 per cent of our global revenues come from outside of North America. From an organisation that has only been shipping product for just on two years that’s quite a different approach to a market that is expanding very quickly. He said the company now had a presence in Sydney, Melbourne and Brisbane. “But clearly our go to market is leveraging that distribution base and the smarts of channel recruitment and using a thin provision front from a sales point of view to be able to extend our channel and recruiting. “Right now we have about 17 partners aligned across A/NZ. But we have about 8 to 10 in the pipeline and we will see some quite significant names emerge. “You will see a revolution in the industry and a game changer in total cost of ownership reduction.